Initial thoughts: there's a lot to like. The general look of the spot is slicker than I thought it would be. You enter though two garage doors, which will stay open during the summer months. The dark wood bar is backed by a long row of tap beers. A dozen flat screen TVs hang throughout the joint. First Ave general manager Nate Kranz said they'll be adding more band photos from the club soon. A cool touch: A few of the smaller screens display a live feed to the Main Room and 7th St. Entry stages. This way you won't be late for your favorite band. Even better: There's a door that leads right into the Entry. The menu is comfort food taken up a notch. There's grilled portobello sliders, baked mac-and-cheese, an inside out burger. One item that's been getting a lot of hype is the Diamond Dog, and rightfully so. The quarter-pound all-beef hot dog (wrapped in pepper bacon and deep fried on a pretzel bun) is everything you think it would be: tasty and intense. 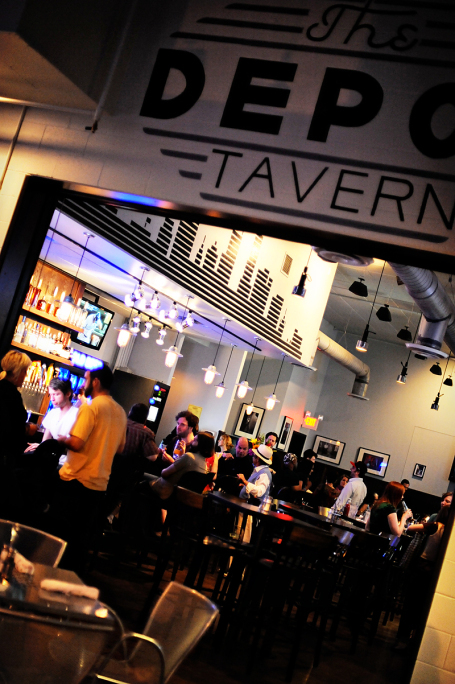 The bar's name is an ode to First Ave's history as a bus depot (the club was originally called the Depot, too). Hours: 11 a.m.-2 a.m. daily. 17 N. 7th St., Mpls. www.first-avenue.com/thedepot.